SupremeSupreme had a wrap-around ad in The New York Post on Monday. The New York Post featured an ad for Supreme on its front page on Monday. 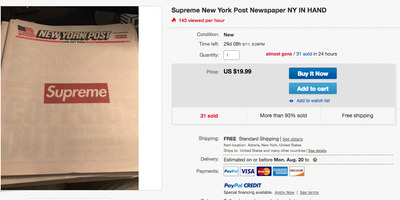 Supreme fans are paying $US20 or more for a copy of the paper, which typically costs $US1.50. The sportswear brand has gained a cult following as well as mainstream backing. A $US500 million cash infusion in 2017 valued Supreme at $US1 billion. 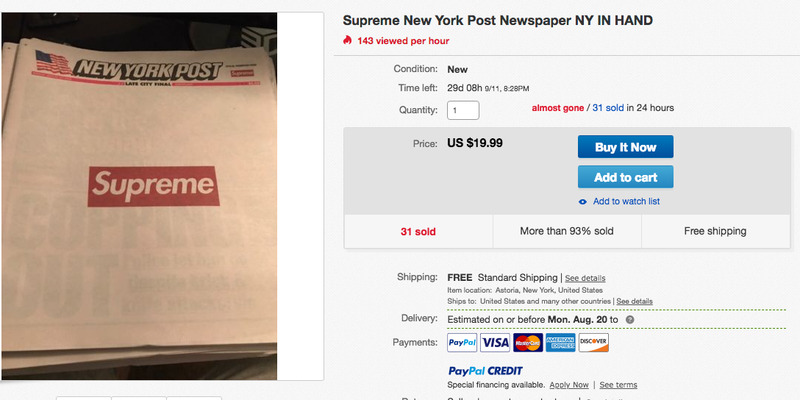 Some people are apparently willing to do whatever it takes to get their hands on a copy of The New York Post that has been remade into a Supreme ad. On Monday, people picking up a copy of The Post would have realised the New York City tabloid had a different look from the usual. The paper featured a wrap-around ad for fashion brand Supreme, the first time The New York Post had premiered such an advertisement for any brand. Now, savvy buyers are already reselling their copies of the paper at a markup. Typically, a copy of the New York Post costs $US1.50. But, this potential collectors’ item is selling for much more. eBay/ericw10291A copy of the paper on eBay. As of noon ET, one eBay seller had already sold 31 copies for $US19.99 a copy. Dozens of other sellers are hawking their own copies of the paper: five for $US85, one copy plus a letter to retailers for $US50, and copies for less than $US10 that quickly sold. Copies have also flooded fashion resale website Grailed, where they were priced between $US7 and $US15. A truly dedicated fan could buy 20 copies for $US150. Supreme has gained a cult following since being founded as a skater-centric brand in 1994. In recent years, it has transformed into a mainstream teen obsession, ranking as the seventh most desirable brand for upper-income teens in Piper Jaffray’s spring 2018 survey. In 2017, Supreme received a roughly $US500 million cash infusion from The Carlyle Group, which valued the apparel brand at $US1 billion.